REDDING, Calif. - Simpson University’s new Undergraduate Studies website has won a “University Standard of Excellence” award in the 2012 WebAwards competition. Founded by the Web Marketing Association in 1997, the WebAward program is the longest-running annual website competition dedicated to naming the best websites in 96 industries. It seeks to set the standard of excellence for all website development. 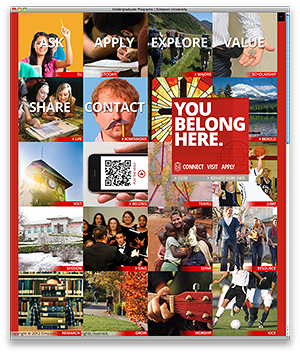 Simpson’s new Undergraduate Studies site (found at ug.simpsonu.edu) received high ratings in all seven categories reviewed by WebAward judges, with especially high marks in design, innovation, content, technology, and ease of use. The site is targeted to prospective students—mainly high-school seniors—who may be largely unfamiliar with the university. “Using the philosophy of ‘gradual engagement’ as a guide, we developed the new site primarily for first-time visitors as a way of providing an engaging and fun way of introducing them to Simpson,” said Ryan Belong, the university’s website administrator. Belong oversaw the team which developed the site, which included graphic designer Travis Quam and programmer Jack Milbourne.